Exciting news at Aesthetics of Essex! We would like to congratulate our Aesthetician Sarah who has been with us since we opened in 2012 for giving birth to a beautiful baby girl called Maisie. Weighing 7lbs 5oz, the winner of our sweepstake was Karen Parker who guessed correctly – lucky guess Karen. We hope you enjoy your winnings! 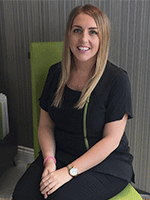 We would like you to meet our new Aesthetician Roxanne. 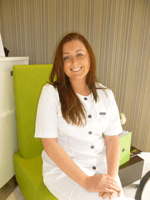 Roxanne is NVQ II & III Medical Aesthetician. She has a foundation science degree in Beauty Therapy and Health Studies and is fully qualified in laser hair removal, tattoo removal, skin tightening treatments, microdermabrasion, derma roller plus more… She’s also trained in Glo Therapeutics and ZO Skin Health by Zein Obagi; both a revolutionary breakthrough in skin care. A brand new treatment is coming soon to Aesthetics of Essex that will instantly remove thread veins called ThermaVein. ThermaVein offers the instant, safe and lasting removal of Thread Veins, Spider Veins medically referred to as “telangiectasia”. There are a variety of more commonly used names to include thread veins, spider veins, rosacea, vascular blemishes and spider naevi. Find out more about our current thread vein removal treatments. We don’t want your to miss out on cosmetic deals – below we’ve prepared a list of all our beauty treatments that are discounted and explained how you can make the most of them. Don’t forget all consultations are free when you book a treatment! We’re currently holding a summer special on our very popular Botox treatments. Get up to three areas wrinkle-free for £199! Botox treatments relax facial muscles for up to 6 months, letting you enjoy a more youthful appearance whilst preventing the formation of new wrinkles. The treatment is non-invasive with virtually no recovery time necessary; you can resume your normal activities straight away! You can find a complete list of dates, treatment areas and prices on our Botox treatments page. Did you know you could save up to £100 when you book both your smei-permanent make-up lip liner treatment with Joanna, and lip filler treatments with Debbie? We’ve combined our lip queens years of experience to give you the perfect lips and save money on not one, but two treatments! Create the appearance of a fuller lip and improve symmetry with lip liner, performed by Joanna. She’ll effortlessly re-shape and enhance your lips using a hint of colour that matches your natural lip shade or favourite lip pencil. Choose between a soft lip line to full lip blush and create the luscious lips of your dreams, before you complete your treatment with our other lip queen! Lip enhancement with dermal fillers is a great way to maximise and improve the overal look of your lips. Complimenting your new lip liner, you can choose the amount of lip filler (from 0.5ml to 2ml) you would like and Debbie will use her skill to craft you the perfect pout. Our Philips Zoom! teeth whitening package includes professional teeth whitening and a home whitening kit! You can benefit from professional laser teeth whitening treatments performed by our qualified dentist Teki, and experience up to 8 shades lift, boosting your whitening experience with a homecare kit for maximum whitening results. Go from yellow to pure white without damaging your enamel or dehydrating your teeth for just £350. Our teeth whitening offer will have you smiling confidently for years to come as results can last up to 3 years. Find out more about the treatment and how to keep your teeth white post-procedure on our teeth whitening treatment page. If you would like to make the most of the discounts mentioned in this article then get in contact to book your free consultation.